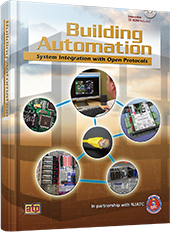 Building Automation: System Integration with Open Protocols builds upon the foundation of control device knowledge covered in Building Automation: Control Devices and Applications. This textbook introduces concepts of automated electronic controls and network communication and provides detailed coverage of the two most common protocols for wired networks: LonWorks® and BACnet®. Each protocol system is described in terms of installation, configuration, operation, maintenance, and troubleshooting. Further coverage of building automation, focusing on control devices, is available in Building Automation Control Devices and Applications.